Mother's Day Gift | Tundeworld! The Mother's Day on the corner. I can help to choose - The Best Mother's Day gifts for your wonderful mum! This is the best present for your Grandma, for your Mom and for your wife. Buy an eGift Voucher for $65 for her and Get 15% off Regular Price. 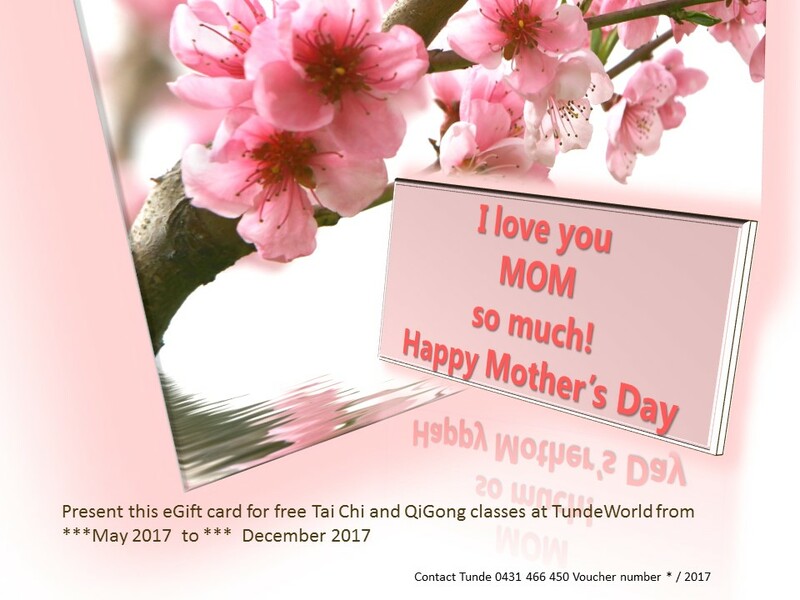 This Mothers's Day eVoucher includes 4 sessions of Tai chi / Qigong in any class at TundeWorld or use it for two Reiki treatments with 15% off. If you like to choose more session for your live it is no problem. Let me know, choose how many session (s) would you like to buy and we will make a calculation for you.